For any alternator its driving torque can be changed by controlling the gate opening in case of hydrogenerators or by controlling the throttle opening in case of turbogenerators. Again we will consider two cases that are alternator with and without load respectively. Suppose that two alternators are running in parallel without any load in them. The excitations for two alternators are adjusted in such a way that the induced e.m.f.s. are equal in magnitude. The resultant voltage in the local circuit will be zero. 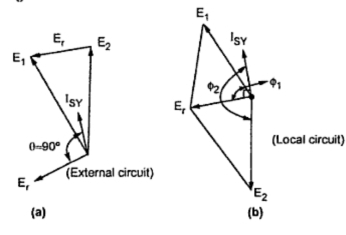 With respect to external circuit the two e.m.f.s are in phase whereas in local circuit they are in opposition. This current lags behind Er by angle of approximately 90o if the resistance of the armatures of the two alternators are neglected. This is represented in following phasor diagram shown in Fig. 1. This circulating current ISY is almost in phase with E1 and in phase opposition with E2. Now here the synchronizing power will come into play. The alternator 1 produces a power E1 ISY cosΦ1 which is positive as Φ1 < 90o while alternator 2 generates a power E2 ISY cosΦ2 which is negative as Φ2 > 90o. Alternately we can say that alternator 1 experience a generating action which will try to retard it and alternator 2 receives the power produced by alternator 1. Hence it will experience a motoring action which will tend to accelerate it. Thus there will be automatic synchronizing action will retard the faster machine and accelerate the slower machine and synchronism is maintained. It can be seen that the autosynchronizing action is on account of Z1 and Z2 considered mainly reactive. If Z1 and Z2 are purely resistive then ISY will be in phase of Er. Then power for both the machines is positive and both will experience generating action. So there would not be synchronizing power will tend to accelerate the slower machine. Note : Thus reactance mainly causes auto synchronization but it is bad for voltage regulation. Again we will consider two alternators which are loaded and running in parallel. The sharing of load between these alternators is governed by speed-load characteristics of their prime mover. In the Fig. 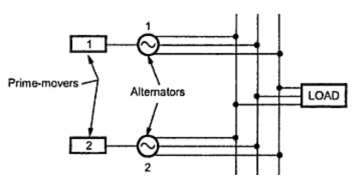 2 the two alternators are shown driven by prime movers 1 and 2. In Fig. 3 the lines 1 and 2 represent the speed load characteristics of prime movers 1 and 2. For clarity and simplicity the slopes are exaggerated. 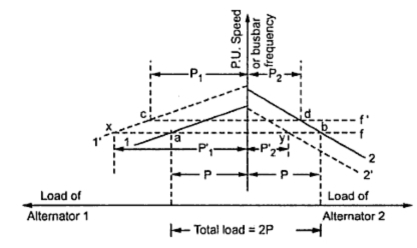 Horizontal line ab represents total load of 2P with load on each alternator as P. The frequency of bus bar is f.
Now if by governer setting, the torque of prime mover 1 is increased, its speed will be increased which will shift its speed-load curve upwards. This is shown by dotted line 1'. Then original operating points a and b are now shifted to c and d. This will give new operating conditions which will increase load on alternator 1 from P to P1 and decrease load on alternator 2 from P to P2 with P1 + P2 = 2P. From the Fig.3 it can be seen that frequency has increased from f to f'. Now, if it is desired to maintain the frequency constant then the input to prime mover 2 must be reduced which will shift its speed-load curve download shown by dotted line 2' The operating points c and d now shift to new points x and y. 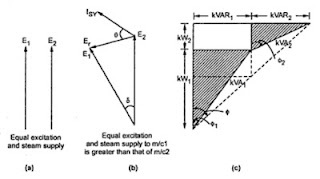 The horizontal line xy indicates that the load on alternator 1 is further increased from P1 and P'1 and that on alternator 2 is reduced from P2 to P'2 such that the relation P'1 + P'2 = 2P is maintained. Thus the load sharing between the alternators and the frequency can be controlled by changing the mechanical torque input to the alternators. By controlling the gate opening of water turbines or the throttle opening of steam turbines, the speed-load characteristics of prime movers can be shifted up and down. To consider what happens internally in the two alternators, let us consider the phasor diagram. Now when mechanical torque of alternator 1 is increased, its output will also increase. But E1, V and Xs are constant. So to increase power angle must be increased from δ to δ1 so new E1 will be ahead of previous position. The alternator 1 shares greater load than P. Therefore for constant load of 2P the load on alternator 2 must be less than P. This will make new E2 to fall back from its previous position. Due to the different positions of E1 and E2, resulting voltage AB appears in the local circuit which will send a circulating current ISY lagging behind the voltage by 90o. This current ISY must be added to I1 and subtracted from I2. The alternator 1 carries increased current I'1 and alternator 2 carries decreased current I'2 but total load current remains same (Ī = Ī'1 + Ī'2). The power factor of alternator 1 is improved from cosΦ to cosΦ1 whereas it is reduced from cosΦ to cosΦ2 for alternator 2. But the load power factor remains unaffected. Thus increase in mechanical torque in case of alternator will increase armature current and improve the power factor. The alternator will share increased load whose driving torque is increased whereas the other alternator which is in parallel is relieved from the load whereas the reactive power distribution remains unaffected. To consider the effect of change in input on corresponding power triangles of the two alternators we will assume that the two alternators are turbo alternators whose prime mover are supplied with steam. Now the excitations for the two alternators are kept constant where steam supply i.e. power input to prime mover of alternator 1 is increased. The two alternators are running in synchronism. So machine 1 cannot overrun machine 2. The increased power input for alternator 1 makes it possible for carrying more load. 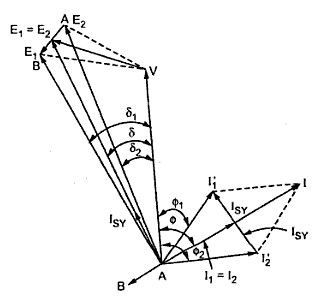 This will make rotor fort machine 1 advancing its angular position by an angle δ. The resultant e.m.f. Er is produced in the local circuit which will setup a circulating current ISY which lags Er by 90o and almost in phase with E1. The power per phase fort alternator 1 is increased by an amount E1ISY whereas it is decreased by same amount for alternator 2. This current ISY has no appreaciable reactive component and it will not disturb the reactive power distribution but active power output of alternator 1 will increase and that of 2 will decrease. This is shown in Fig. 4. Note : The change in input to the prime mover will change the distribution of load between the alternators.